Deconstructing the mechanistic basis of neurodegenerative disorders, such as Huntington's disease (HD), has been a particularly challenging undertaking, relying mostly on post-mortem tissue samples, non-neural cell lines from affected individuals, and model organisms. Two articles recently published in Cell Stem Cell report first the generation and characterization of induced pluripotent stem cell (iPSC)-derived models for HD, and second, the genetic correction of a disease-causing CAG expansion mutation in iPSCs from individuals with HD. Taken together, these two studies provide a framework for the production and validation of iPSC materials for human neurodegenerative disease research and yield crucial tools for investigating future therapies. Huntington's disease (HD) is a progressive, autosomal dominantly inherited neurodegenerative disorder, characterized by impaired motor control, cognitive decline, and occasional psychiatric illness. HD results from the expansion of a CAG repeat in exon 1 of the huntingtin (HTT) gene, yielding a protein with a polyglutamine (polyQ) expansion tract near its amino terminus. This polyQ-expanded huntingtin protein has a propensity to misfold, making it resistant to proteasomal and autophagy-mediated degradation. Earlier age of disease onset and more rapid disease progression correlate with increasing CAG repeat length, with HD manifesting in patients carrying 40 or more CAG repeats. HD is the most common polyQ repeat disease, with a prevalence of at least 1 in 10,000 in the USA and Europe. In HD, polyQ-expanded huntingtin protein is expressed throughout the brain, with the most severe degeneration occurring in striatal medium spiny neurons and cortical projection neurons that extend to the striatum. Currently, HD research is conducted in rodent models, rodent primary neurons, and non-neural human cell lines, but there are questions as to whether such systems yield findings that are truly relevant to the mechanistic basis of human HD pathogenesis. About six years ago, Takahashi and Yamanaka  developed a method for reprogramming human somatic cells so that they entered a pluripotent state, allowing for further differentiation into other cell types, including neurons. This induced pluripotent stem cell (iPSC) approach has ushered in a new era of human neurodegenerative disease modeling. Two recent publications, one from The HD iPSC Consortium  and another by An et al. , respectively, reported the generation and characterization of iPSC-derived models for HD and the genetic correction of a disease-causing CAG repeat expansion mutation in iPSCs from individuals with HD. Together, these two studies provide important insights into the utility and limitations of iPSC modeling of neurodegenerative disease. One of the greatest challenges facing the iPSC modeling field is the enormous variability of different iPSC lines and the neurons derived from them. As generation and characterization of iPSC lines can be laborious and costly, one obvious solution to assure the validity of iPSC disease models is to create research teams that work together on a particular disorder, sharing iPSC lines and derived neurons. This very strategy was applied in the HD iPSC Consortium study , in which eight different groups produced iPSCs from three individuals with HD and three control individuals and used them to assay a wide range of phenotypes. These included gene expression, cell adhesion, bioenergetics, glutamate toxicity, cell death, calcium flux, and trophic factor withdrawal. These phenotypes were assessed in neural stem cells (NSCs) grown in spherical aggregates under defined growth factor conditions, as well as in differentiated striatal-like neurons obtained using both long and short differentiation protocols, which differed in the growth factors that were added. This comprehensive inventory of cellular and molecular assays revealed that certain phenotypes correlate with HD disease CAG repeat length, whereas other phenotypes do not. The common results that were recapitulated across the various laboratories highlight the integrity of the developed iPSC lines, making the HD iPSC Consortium study an impressive blueprint that is worthy of emulation. The study by An et al. had quite a different goal: to perform genetic correction in an HD-iPSC line, thereby creating an isogenic revertant iPSC line that would carry two normal-length HTT alleles. These 'corrected' controls had a genetic background that was identical to that of the 'uncorrected' iPSC line, so any phenotypic or expression differences between the two could be solely attributed to the CAG expansion. The 'corrected' line was created successfully using a standard recombination approach, allowing the comparison of a number of cellular and molecular characteristics between the mutant progenitor line and the normalized derivative line. These comparisons reinforced the pathogenic importance of certain key pathways. This study also demonstrated that the genetically corrected HD-iPSC line could be used to produce NSCs using a protocol described previously by this group . Furthermore, these NSCs could be successfully transplanted into the striatum of HD mice, were able to populate this crucial brain region, and then underwent proper differentiation into neurons and glia. Thus, the stage is set for the potential future application of this strategy as a therapeutic intervention in HD. In tandem, these papers catalogue a variety of phenotypes that were observed in HD-iPSC-derived neural progenitors and in medium spiny neurons. Both groups performed gene expression analysis to compare HD-iPSCs and their neuronal derivatives. The HD iPSC Consortium findings implicated genes that are involved in cell signaling, cell cycling, axon guidance and neuronal development as dysregulated in NSCs (Figure 1). Importantly, medium CAG repeat expansions and longer CAG repeat expansions expressed most of these genes differently. An and co-workers performed transcript expression analysis, although they did this in iPSCs rather than in iPSC-derived NSCs. They observed that, in comparison with corrected controls, HD-iPSCs showed increased expression of genes that are involved in TGF-β signaling and decreased expression of genes involved in cadherin signaling (Figure 1). Notably, the expression differences between the HD-iPSCs and corrected HD-iPSCs were of an order of magnitude less than those between non-related control iPSCs and HD-iPSCs. HD-iPSCs, corrected iPSCs, and iPSC-derived neurons reveal key disease-associated phenotypes. An et al. and the HD iPSC Consortium  generated HD-iPSC lines. An et al. also generated corrected HD-iPSCs by homologous recombination and showed that, when compared to corrected HD-iPSCs, HD-iPSCs have increased expression of genes that are induced by the TGF-β signaling pathway and decreased expression of cadherin pathway genes . HD-iPSC lines developed by the HD iPSC Consortium were further differentiated to form NPCs and DARPP-32-positive striatal-like neurons . These NPCs yielded evidence for the altered expression in HD of genes that are involved in cell signaling, cell cycling, axon guidance, and neurodevelopmental pathways. As delineated here, future studies might compare these two datasets and thus could evaluate the expression of the target genes of those transcription factors known to interact with huntingtin, examine mitochondrial dysfunction in HD and investigate the exact identity of the dying cells in HD. NPC, neural progenitor cell; ROS, reactive oxygen species; TF, transcription factor. Comparison of the two studies also highlights the shared relevance of certain cellular and molecular phenotypes, such as cell death and mitochondrial dysfunction (Figure 1). Initial studies had previously indicated that HD-iPSC-derived NSCs display increased caspase activity , and that both HD-iPSCs and derived neurons exhibit increased lysosomal activity . An important finding that is shared by the two groups relates to defects in energy metabolism. Mitochondrial dysfunction, resulting in impaired cellular bioenergetics, is an emerging hallmark of HD . The HD iPSC Consortium reported decreased intracellular ATP levels in HD neural progenitor cells (NPCs), and An et al. observed decreased oxygen consumption rates in HD-NSCs compared to corrected controls. Both of these phenotypes revealed defects in energy metabolism in the HD models, but the importance of mitochondrial dysfunction requires further investigation. Another HD-associated phenotype that was observed by both groups is increased cell death. The HD iPSC Consortium used a variety of assays, including longitudinal survival tracking, nuclear condensation assays, and caspase 3/7 activation, to detect increased cell death in HD-NSCs and striatal-like derivatives. An and colleagues also observed CAG repeat-length-dependent cell death in similar assays. Both groups demonstrated a more severe cell death phenotype upon withdrawal of brain-derived neurotrophic factor (BDNF), adding to the mounting evidence to support a role for BDNF-associated toxicity in HD . BDNF is a secreted neurotrophin, which undergoes transcriptional repression in certain HD models, and there are indications that over-expression of BDNF can ameliorate the HD phenotype . Cell death in the striatum and cortex are hallmarks of HD; hence, this shared observation is significant, as it recapitulates in vitro what is seen in vivo. An et al. have taken an initial step toward the application of corrected HD-iPSC-derived neurons in cell replacement therapy. They showed that differentiated striatal-like neurons can survive transplantation into mouse brain, but they did not report whether transplanted R6/2 mice exhibited any recovery in phenotype. Despite this uncertainty, it is quite clear that the newly derived HD-iPSC models hold great potential for use in drug screening. As illustrated in Figure 1, future studies should examine effects on HTT interactor target genes, and compare the results so obtained with the data sets from these two studies. The observations from both studies regarding gene expression and mitochondrial dysfunction support findings generated in other models. The huntingtin protein is known to interact with a number of transcription factors and co-activators, including CREB-binding protein (CBP), Sp1, TAFII130, and PPARγ co-activator 1α (PGC-1α) . Follow-up analysis of the expression of the target genes that encode these already-implicated transcription factors might be worthwhile (Figure 1). 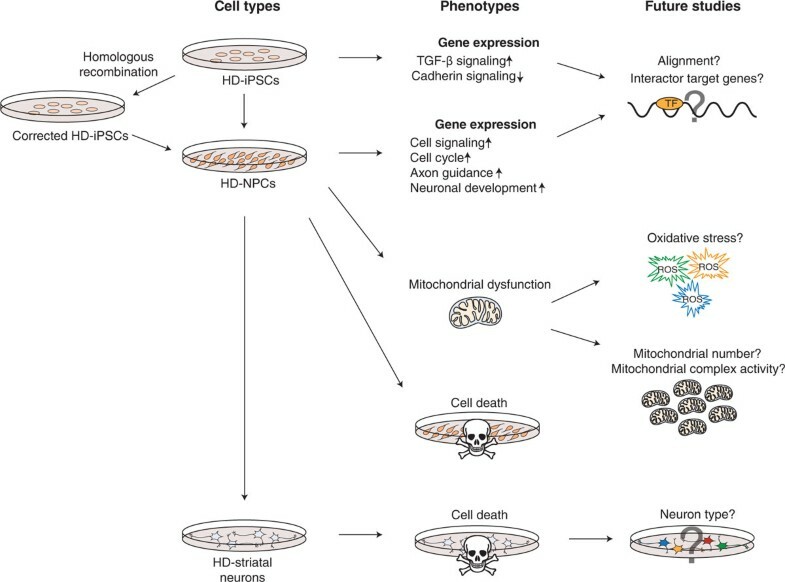 Diminished PGC-1α function appears to be a major contributor to HD pathogenesis , so the HD-iPSC model could be used to evaluate the mitochondrial phenotypes seen in HD mice, including decreased mitochondrial complex activities, decreased mitochondrial number, and increased oxidative stress. PGC-1α overexpression can rescue HD-associated phenotypes in mice by inducing Transcription factor EB (TFEB), a master regulator of autophagy . Validation of the role of PGC-1α and TFEB dysfunction in HD-iPSC models would be worthwhile and could facilitate the development of new therapies. Finally, a missing piece of the puzzle is the exact identity of the dying cells in HD. The HD iPSC Consortium used a method for tracking live cells through longitudinal studies, which allowed them to identify the dying cells as being morphologically similar to neurons, although the specific neural type was unspecified. As HD patients with longer CAG repeats suffer more widespread neuron cell death, it will be important to determine if the vulnerability of iPSC-derived neurons differs between neural cell types (Figure 1). Amelioration of cell death in a relevant iPSC-derived neural lineage could be a useful indicator of potential drug efficacy. Once the HD field homes in on viable lead compounds, HD-iPSC models could serve as invaluable tools for validation and should accelerate therapeutic development. The authors acknowledge funding support from the NIH (R01 NS065874) for their Huntington's disease research.